Vehicle Identification Number, commonly known as VIN, is a unique code that is used to mark and identify automobiles. Just like fingerprints, no two vehicles share this unique identifier. Composed of a total of 17 characters, the VIN can be used in several ways. Therefore, you should consider taking advantage of the free New York VIN check. Whether you are looking to buy a used vehicle or would just like to know your vehicle’s VIN, you should know where to find the unique code. The VIN can be found by looking at the vehicle’s dashboard from the windshield on the driver’s side, at the point where the dashboard and windscreen meet. The VIN can also be found on the door post on the driver’s side door. It also appears on documents such as insurance documents, service records, and New York vehicle title. Free VIN lookup services are frequent throughout the internet. Most "free services" however do not provide any really important information. They generally try to upsell you on a paid report. The top free VIN check providers provide all specs of the car and trim version, National Highway Traffic Safety Administration (NHTSA) recalls by VIN, pricing analysis and any accidents where an insurance claim was made.We have done a deep dive through the Internet to find the top VIN lookup services that will provide you with a free VIN check and a limited free Vehicle History Report. Below is our list of the best free services to learn about your car’s history. 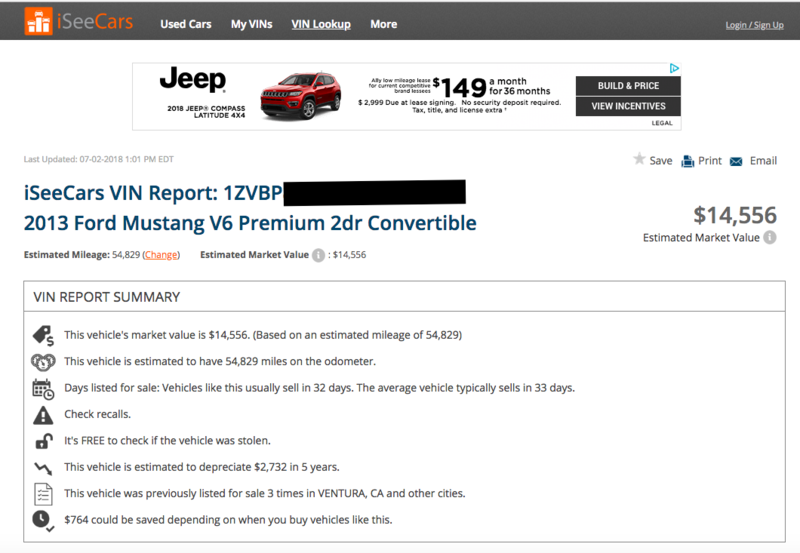 iSeeCars.com offers a basic VIN number check report, detailed pricing analysis based on similar cars that are featured and sold on their site, and basic car specs. One key feature of the free VIN number check they provide is the estimated value that is based on mileage, which you can modify from the default estimated mileage.If you are trying to buy or sell, iSeeCars will provide you with the price breakdown according to your specific car condition. While it might not be able to tell you if the car has been stolen, it will keep you from getting cheated. 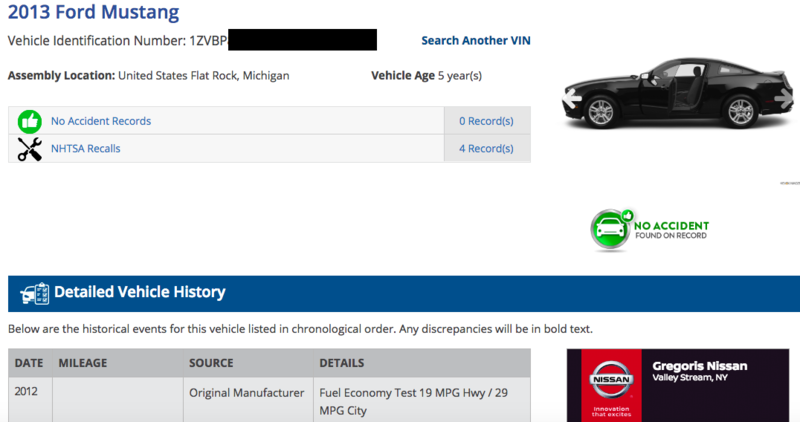 VehicleHistory.com provides a simple VIN number lookup report and detailed car specs, like front and rear leg space, shoulder room, and hip space dimensions. When you using VehicleHistory, you will know your vehicle like the back of your hand. It is the encyclopedia of VIN lookups. 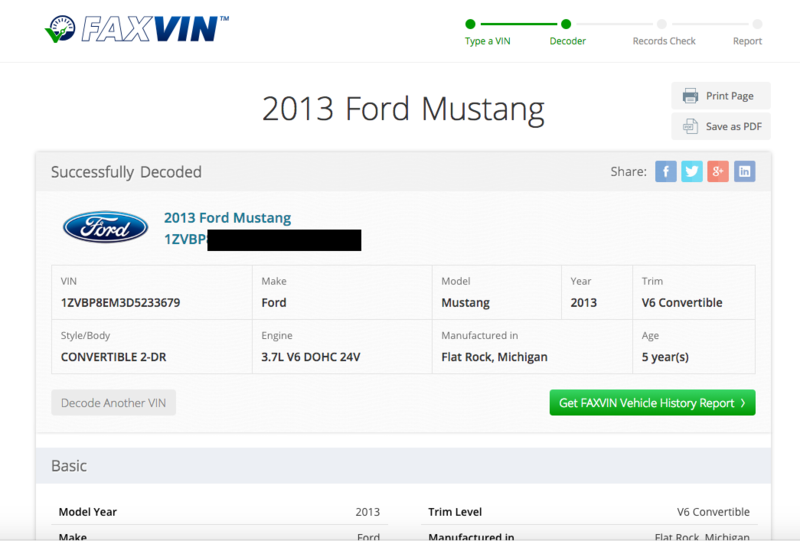 Faxvin.com gives a basic VIN number search report and detailed specs overlook of the car. Complete vehicle history reports are provided for a fee. Additionally, FaxVin includes information about all reported damages.This service will give you everything you should know about your vehicle. Whether the car had a fractured fender during a rear-end accident or a broken ego during a bad standup. FaxVin will give you the details if it was reported to the insurance company. A VIN check can reveal some important details about your car. With a free New York VIN lookup, you will be able to establish the model year, country of origin and manufacturer of the vehicle. The VIN decoder will also show the brand or make of the vehicle, the vehicle type, drive type, engine information as well as the body style. In addition to these details, you may also get details on the safety features and NYS title status of the car. For all the details that the VIN pattern will reveal, there are certain pieces of information the pattern will not capture. Since not all the information you seek will be in there, you should know what to expect during a free VIN check. When you conduct a vin number check for a car, you should not expect to get details about the vehicle’s trim, the transmission, color, upholstery or optional equipment. The pattern will also not decode information relating to the curb weight or the original sale price of the vehicle. The uses of a VIN go beyond just marking and identifying cars. When you are thinking of buying a used car, a VIN check will allow you to access and view records of that specific vehicle. These records will help you to determine whether it is a stolen car, whether there are faulty odometer settings, if the car has been involved in a major incident in the past, when the vehicle was last inspected as well as how many people have owned the vehicle by conducting a title search NY.Police can also use VIN to search for search for a stolen vehicle or find the truth about any car. Some people also use a VIN to track registrations, recalls, insurance coverage and warranty claims. Since some vehicle parts are specific to certain VINs, the unique code could come in handy when you are looking to purchase replacement parts.